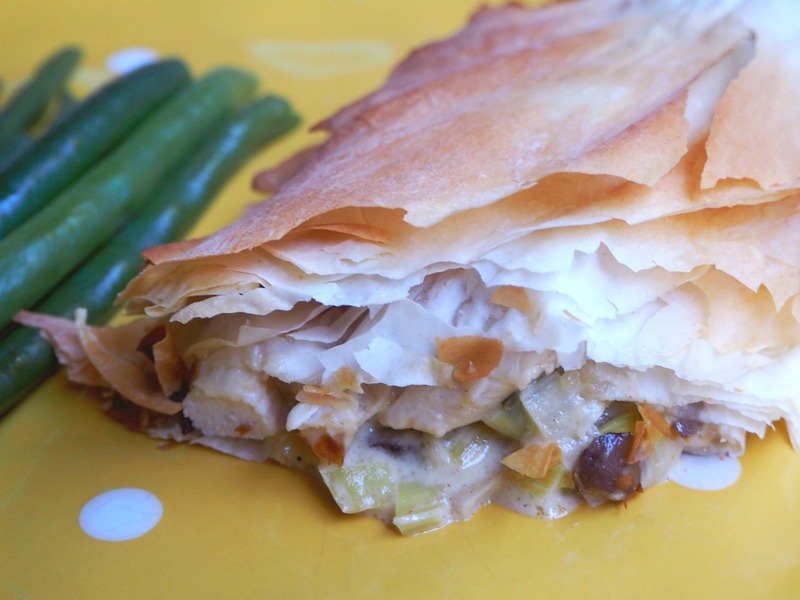 Stuffed with chicken, mushrooms and leeks, these creamy filo parcels are a light and easy alternative to pie but just as delicious! It’s no accident that I’m sharing this recipe on Valentine’s Day because this is one of our most loved recipes. I’m in the motherland right now with my mum but if I was at home, I’d definitely dish these filo parcels up for dinner because they’re our favourite. The beauty of these filo parcels is that they’re easy enough to make for a midweek dinner but fancy enough to serve up when you’re entertaining. The filling is really easy to whip up and best of all, it can be made ahead and stored in the fridge until you need it. Too easy! The truth is that this recipe has been sitting in my drafts folder for THREE years and I have made it SO many times. You see, I’ve been waiting for the right time to get the perfect photo but there’s always a technical hitch – too much light, not enough light and/or most commonly, these parcels are just too delicious to wait for a photo! So after 3 years of procasti-picture-taking, I’m posting this recipe with the original pictures I took in 2016 because this recipe is just too good not to share! Of course this isn’t my first foray with filo, have you seen my Spinach, Mushroom and Feta Filo Pie? Or if sweet things are more your style, you must check out my Apple and Blueberry Filo Pie. It’s the business! 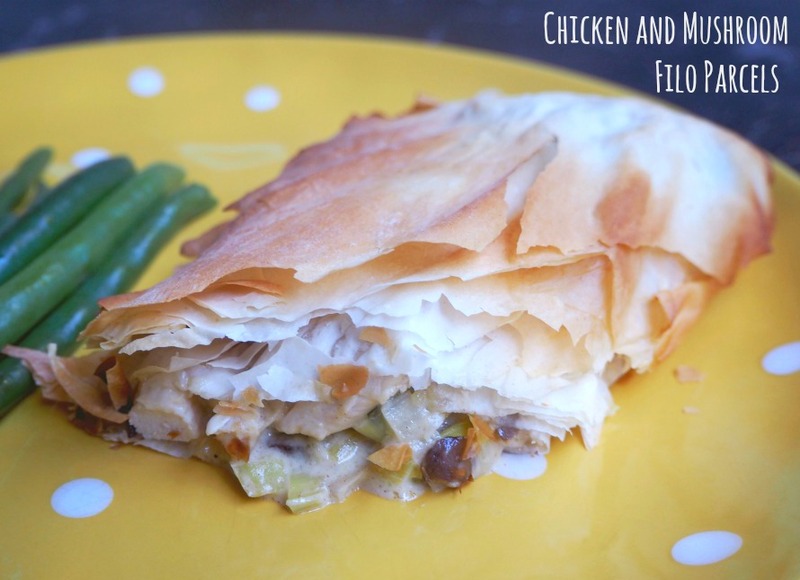 Filo is so lovely and light and if you’re weight watching, it’s a great alternative to puff pastry, especially in a dish such as this! Don’t wait for a special occasion to make these Chicken and Mushroom Parcels because every day is special, don’t you think? 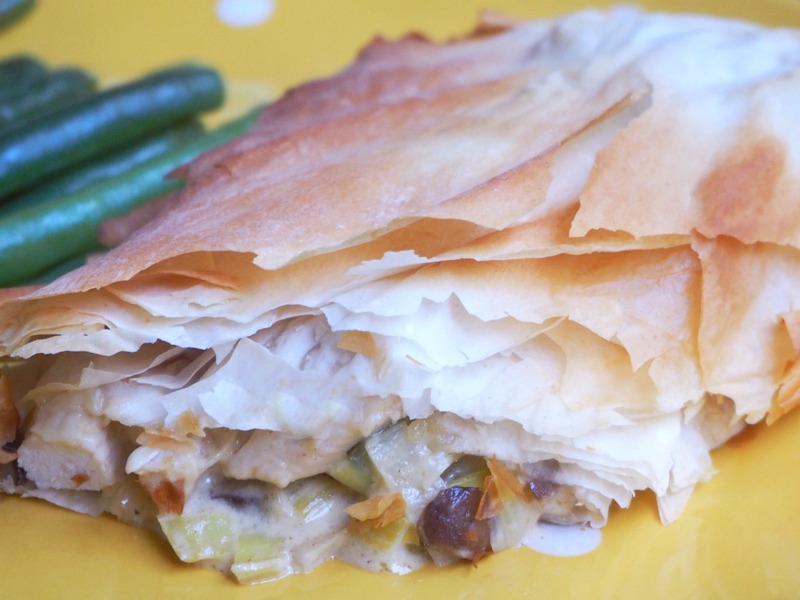 Have you got a favourite filo recipe? What’s your go-to winner, winner chicken dinner? Preheat oven to 200 C / 180 fan-forced. Line a baking sheet with baking paper. In a large, heated, oiled pan cook the chicken in batches until lightly browned and cooked through. Set aside. Cook the mushrooms in the same pan until lightly brown and tender. Add the leek and cook gently until softened. Return the chicken to the pan and add the sour cream, mustard, cheese and tarragon. Stir gently until combined. Working with 4 pastry sheets at a time, cut the sheets in half vertically and lightly brush with oil between each layer. Repeat with the other four sheets of pastry. Bake for 10 minutes until the pastry is crisp and golden and the chicken is hot. Serve with steamed veggies.